Modern, spacious and functional apartment with a good situation in Seville downtown (Triana neighborhood). In this apartment we can underline its 4 bedrooms (something difficult to find in the center), 2 bathrooms and the spacious living-room. The apartment is located in a renovated building of 2009 with a big central courtyard, which gives the apartment a lot of light and peace. The location of this apartment should be also mentioned, situated very close, among others, to the following monuments and landmarks: Torre del Oro (400 m.), La Maestranza bullring (500 m.), Cathedral and Giralda (900 m), etc. Facilities and equipment. Kitchen: ceramic hob with 4 rings, fridge, freezer, microwave, electric coffee maker, coffee grinder, kettle, sandwich maker, cooking utensils, etc. Utility room: washing machine, dishwasher. Living-room & sitting-room: TV, DVD, CD player, radio, sofa-bed, sofa, table and chairs (seating for 10 persons), books. Bedroom 1: 2 single beds (90x190cm), closet, sheets and bed linen provided. Bathroom 1: bath with shower, toilet, washbasin, towels provided. Bedroom 2: 1 large double bed (135 x 190 cm), closet, sheets and bed linen provided. Bedroom 3: 2 single beds (90 x 190 cm), closet, sheets and bed linen provided, etc. Bathroom 2: bath with shower, toilet, washbasin, hairdryer, towels provided. Bedroom 4: 1 large double bed (135 x 190 cm), closet, sheets and bed linen provided. Outside facilites (terrace): small terrace for drying clothes. General: air-conditioning, central heating, washing machine, dishwasher, iron, ironing board, hairdryer, baby cot. Internet access: Wi-Fi included. Additional services: bed linen provided, towels provided, aiport transport under demand, housekeeper optional. 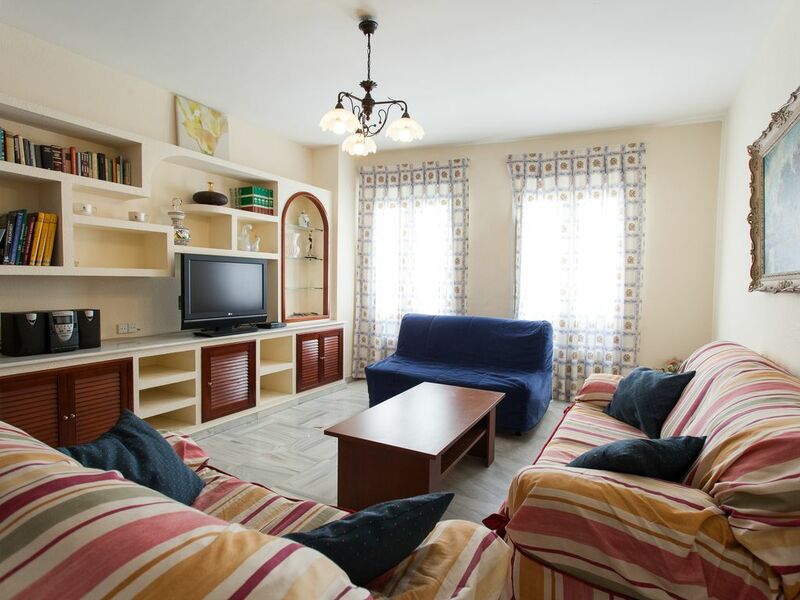 General information Property type: self-catering apartment. Location (address): street Pages del Corro. Capacity (sleeps): 4-10 persons. Surface area: 140 m2. Internet access: Wi-Fi included. Layout: kitchen, utility room, siting-room & living-room, 3 bedrooms, 2 bathrooms. Floor : first floor in a 5 floor building (with elevator). Year of construction-last renovation: 1995 - 2009. Closest airport: Seville airport (named San Pablo), 7 km. Railway station: Santa Justa Railway Station, 3 km. Bus stations: Prado Bus Station (2 km) and Plaza de de Armas Bus Station (1.5 km.). The apartment is very nice and huge. Triana is a fabulous place to stay and see Sevilla. Nacho was very accommodating...we had no problems at all. "Flat well located and ideal for large family or several couples (4 bedrooms). Everything you need is on had, plus quite a lot of minor necessities supplied by Nacho. Make sure you get the heating system explained and demonstrated, as it is VERY complex!" Address: Pages del Corro street (neighborhood Triana). Situated on the first floor with elevator. Aspect: north-east, view of town opposite. Distances to main landmarks in Seville: Cathedral & Giralda (700 m); Alcazar (700 m); Bullfighting ring (400 m), Torre del Oro (400 m); Casa de Pilatos (1.5 km); Archivo de Indias (600 m.); Calle Sierpes (1 km); Plaza de España (1 km); Fabrica de tabacos (700 m); Plaza de la Encarnación (1.5 km). Activities nearby: amusement park, boat trips, casino, cinema, Equitation, Golf, horse riding, leisure park, municipal swimming pool, museum, night club, spa, thalassotherapy, theatre, thermal baths. The vicinity: the famous Barrio de Triana, on the other side of the Guadalquivir River, has its own and distinctive personality. Historically linked to the river, one of its sons, Rodrigo de Triana, was the first to see the New World. Juan Sebastián Elcano landed there next to the Covent of Los Remedios upon his return from the first voyage round the world in 1519. Birth of famous potters, in the 3rd century AD, Saints Justa and Rufina, from Triana, were the first Sevillian martyrs to be canonised. Traditional Triana, where gypsies and non-gypsies live together harmoniously, where the popular and lively velás are celebrated in August, has Santa Ana as its own "cathedral", presiding over the other churches in the quarter: those dedicated to La Esperanza, La Estrella, La O, and El Cachorro. Other distances: Airport (7 km. ), bank (100 m), beach (100 km. ), bus station (1 km. ), bus stop (100m. ), cash machine (100 m.), hospital (1 km. ), internet café (200 m.), park (600 m.), pharmacy (100 m.), restaurant (100 m.), shopping centre (100 m.), shops (100 m.), subway (200 m.), supermarket (20 m.), taxi rank (100 m.), town centre (inside), train station (2 km. ), closest bike post (100 m.). Bus stops closeby: C3, 40. Click on http://www.tussam.es/ for more information. Closest subway station: Line 1 (Plaza de Cuba). Click on http://www.metrodesevilla.org/ for more information. Closest public bike posts: calle Pages del Corro (post #111). Click onwww.sevici.es/ for more information.